NTT DATA MSE Corporation has implemented a connectivity functionality (Miracast™) onto a Connected Car platform "AGL Unified Code Base (: AGL UCB)" provided by Automotive Grade Linux (: AGL), which is workgroup of The Linux Foundation (http://www.linuxfoundation.org/) and realized the demonstration work on Renesas Electronics' R-Car M2 Application Development Board. This demonstration had been showcased as "Proposal of a use case for a drive using Miracast™ technology" at NTT DATA MSE's booth in the AGL Demo Suite during the GENIVIⓇ CES 2017 demonstration showcase to be held at Bellagio in Las Vegas, U.S.A. starting on January 5th, 2017. 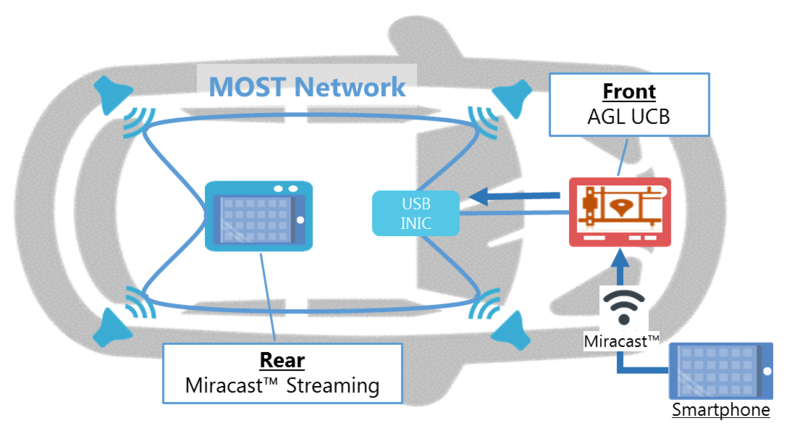 "Proposal of a use case for a drive using Miracast™ technology"
It is a demonstration that connects smartphone and IVI by implementing Miracast™ onto AGL UCB provided by Automotive Grade Linux. The video and audio are streaming from a smartphone via Miracast™ and played on a rear display through the MOST® network. NTT DATA MSE will provide a service where the driver can get the drive information and passengers can get the entertainment. Users can control their smartphone by touching the display. We would like to share some of the valuable opinions we received from these visitors. It is interesting point that you can port the component of Tizen IVI to AGL UCB and realize reducing the development term. I would like the community to develop AGL UCB. It seems that AGL workgroup looks like the development of mobile phones 10 years ago. 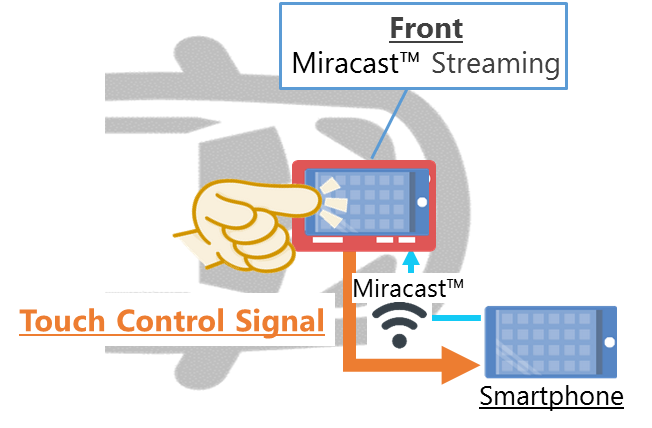 I'm very interested in the use case of Miracast™ considering Driver's Distraction. 	I think that it is a scheme that can effectively utilize front and rear displays. Taken a request by the Linux Foundation, Hiroto Imamura who is the manager of Platform Strategy Office had explained the concept of our demonstration. Please take a look at a movie.